Often we only have a very brief interaction with clients because we get them off the streets quickly and never see them again. Below however are some examples of the more complex cases RTS has worked on. The story of Andrei, a homeless man from Timisoara, Romania, reveals how organized criminal networks offer work to homeless people and then use them as slaves. Andrei grew up in an orphanage in Lugoj but became homeless and learnt to live on the streets. He was lured away from this very poor existence to England with promises that came to nothing. The gang offered accommodation, food and money along with a new start in London and in return asked him to help them collect scrap metal. He accepted at once. The accommodation turned out to be the van they used during the day. He slept in it with two others but they were not allowed the keys to the vehicle and, as it was winter, it was bitterly cold. His “employers” slept in hotels. The days were long and hard. They travelled across London searching for anything of value. He was given no pay and little to eat yet he was trapped in a foreign country and had no way of getting home. At the same time he needed to get away from his captors and one night left the van and walked into the darkness still having little idea of how he would be able to return to Romania. He slept rough on the streets of London for several weeks and one night he came across Euston train station and decided to sleep there. The following morning he was discovered bedded down by the Camden Routes off The Streets team. The temperature was way below freezing and so he was taken into emergency cold weather accommodation and whilst there he let it be known that he wished to return home. Therefore Barka UK were called and their Romanian worker was able to translate and get the full facts of his predicament. As the cold weather accommodation was closing he was put into a place of safety. From there he was escorted back to Timisoara but this time, as he was being reconnected via Barka, given accommodation. He no longer lives on the streets and has learnt form his experience. He has also had an article published in a local newspaper to warn others of what happened to him and believes he had a very lucky escape. Peter is a 53 year old man who had been rough sleeping for well over ten years. He was a wanderer who moved around London and had no connection to any borough. Many outreach teams had tried to work with him but he was insistent that he wanted no help or support and was happy as he was. He was a prolific shoplifter with a record of 57 prison stays, the main reason behind this being his addiction to crack, heroin and alcohol. Due to his time on the streets and his substance use he was also very physically unwell, but refused offers of treatment. For most of his time on the streets he did not have a benefit claim running and relied on handouts and the proceeds from his shoplifting to supply all his needs. RTS persistently offered him support and, one morning, after a particularly cold night, he finally agreed to use a severe weather emergency bed. This began a line of communication and relationship building that led to him making a successful benefits claim and being housed in Arlington House in April 2014. Due to his long time on the streets Peter found it very hard to settle and just two weeks after he moved in to the hostel he was evicted for threatening behaviour. However he had managed to access support around his drug use, was on a methadone prescription for the first time and had stopped using drugs. His alcohol consumption had increased however and was a contributing factor in his deteriorating behaviour. He returned to a hostel, after a short spell on the street, this time Endsleigh Garden. He lasted three months before again being evicted, this time for violence. The positive news was that he now recognised that his alcohol use was the cause of his poor mood and resulting aggressive behaviour. 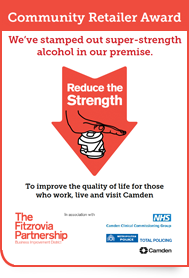 He therefore agreed to access support at the Camden Alcohol Service and his drinking diminished. His attitude to rough sleeping had changed as well and he was very keen to be re-housed. He was placed in Denis Hanfield House at the end of 2014 and then moved into a privately rented flat in Hendon in March the following year. Whilst at DHH he also agreed and received treatment for his physical ailments and is now in far better health. Peter appears to have settled well into his flat but will continue to receive ongoing support for the foreseeable future, which he is now happy to accept. Tommy is a British man born in the late 70s. He has been known to homelessness services for more than ten years and has been in contact with Camden RTS for more than six years. He is diagnosed with Schizophrenia and reports hearing voices, which he converses with regularly. Although the voices do not upset him they make it difficult for him to make or maintain relationships with other people. For 6 years, despite many offers of support to find accommodation, Tommy refused everything we offered him. He consistently claimed that he was happy to stay on the street and did not want to go indoors. We suspected this was because his mental illness made it very hard for him to be around other people. Despite Tommy’s insistence that he was content living on the streets, his mental and physical health was clearly deteriorating and he was begging to survive. RTS was increasingly concerned that his mental health problems were keeping him on the streets and therefore arranged joint shifts with Focus, Camden’s mental health outreach team. Last year, Tommy was also given a specialist case worker as part of the social impact bond scheme (SIB). This enabled more intensive work to be done with him. RTS worked closely with SIB and Focus, carrying out joint shifts, sharing information and working together to put together a strategy to support Tommy in a way which he would accept. As a result Tommy began to open up more about his situation and conceded that there were areas of his life that he did indeed need support around. RTS, Focus and SIB then came up with an unusual but effective plan. They decided to offer Tommy a bed and breakfast for one night only during a particularly cold spell. The idea was to slowly get Tommy used to sleeping indoors again. Tommy agreed to spend a night in a bed and breakfast and, despite returning to the street afterwards, said he had liked it. He was therefore offered further occasional stays in B&Bs for one night at a time which he accepted. Slowly he was beginning to warm to the idea of moving into accommodation. At this time he also began to talk more about his mental health and the things that were preventing him from moving off the streets. After a short time he finally accepted a bed at St Mungos’ Endell St Hostel in Covent Garden after 8 years on the street. He is now engaging well with staff at the hostel and has begun the process of rehabilitation. He is making real progress in his recovery from 10 years of living on the streets. He has done so well that he was recently nominated for an award given to hostel residents who have made major positive changes to their lives. Mirek is a Polish national who came to the UK to find work. Things didn’t work out for him and he ended up unemployed and sleeping rough. RTS helped him to return to Poland in 2011 but he returned to try again to find work. Unfortunately, once again, he ended up on the street. Mirek became depressed and developed a serious alcohol dependency problem. Over the next three years his mental and physical health deteriorated due to his life on the streets and his drinking. He had a number of hospital admissions suffering from problems with his legs and extreme dehydration. His attempts to find work were no longer realistic as he was now too unwell to be able to hold down a job. Mirek was surviving from handouts from charities and selling the Big Issue. He was still adamant that he would find work and refused offers of reconnection to Poland where he had family. The number of foreign nationals who come to the UK to find work but fail and end up sleeping rough is an increasing problem in Camden. The shame of their failure and the desperate circumstances they have found themselves in is often so powerful that they would rather stay on the street than go home to face their friends and family. In October 2015 RTS received a call from the Lambeth outreach team, also run by Change Grow Live. They said Mirek was also known to them as he was now moving between boroughs. They told us that they had received a call from University College Hospital in Euston, where Mirek was now an inpatient. They requested RTS go and see him. We found Mirek in a terrible state, dehydrated and with severely swollen legs. He could barely walk. We offered to get him back to Poland but he refused and discharged himself as soon as he could get out of bed. He was extremely vulnerable on the street now, as he was so physically unwell and seriously alcohol dependent. He was selling the Big Issue but was attacked and robbed of all his earning and all his documents. In February 2015 he was once again admitted to hospital after an accident which had led to a serious brain injury. He had no memory of the accident and no ID. Fortunately he had the number of the Lambeth outreach team in his pocket and they were able to identify him and refer him back to RTS. Poland and explained his circumstances. It turned out that Mirek was very well educated having earned a masters degree before coming to the UK. However this would not be of any help unless he could get his health back and deal with his alcoholism. His family spoke to him and they all agreed that he needed to return to Poland but explained they could house him as his father was also very ill and was being cared for by his step mother who he had a very difficult relationship with. They were also not able to manage his alcoholism. RTS therefore called BARKA, an organisation that works with Eastern European rough sleepers to support them to return home or find work. BARKA was able to put Mirek in touch with Agape, an organisation in Poland who offer accommodation and rehabilitation for homeless people. He applied and was accepted into one of their projects in Gdansk in Poland. His return to Poland was paid for by BARKA and a BARKA worker accompanied him on a flight back to Poland as he was still very confused due to his brain injury. Mirek is now living in an Agape project. They have also referred him to Polish social services who will be offering him accommodation and aftercare once he has finished his rehabilitation programme.